AMAZING! This Young Lad Stopped Suicidal Man From Jumping With Three Simple Words.. 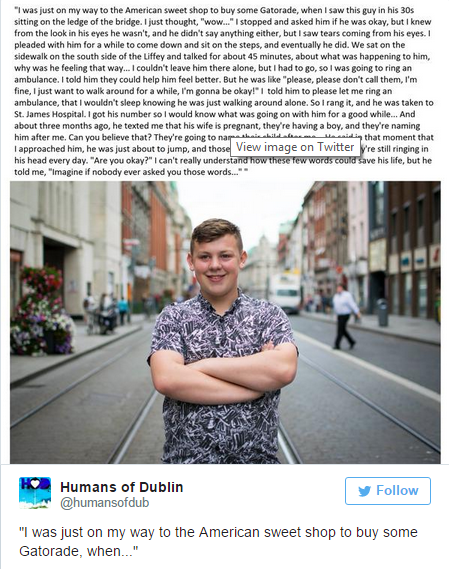 The Irish teenager went up to the man after he saw him sat on the edge of a bridge in Dublin. After a 45-minute conversation he managed to persuade him to go seek treatment at hospital. The man is now expecting a baby boy with his wife, and they’re going to name him after Jamie. "It was just instinct to help that man and now lots of people around the world know about it. I hope it makes people open their eyes to what is going on around them. I like to help people who need help. "I stopped and asked him if he was okay, but I knew from the look in his eyes he wasn’t, and he didn’t say anything either, but I saw tears coming from his eyes. I pleaded with him for a while to come down and sit on the steps, and eventually he did. "I couldn’t leave him there alone, but I had to go, so I was going to ring an ambulance. I told him they could help him feel better. I told him to please let me ring an ambulance, that I wouldn’t sleep knowing he was just walking around alone. So I rang it and he was taken to St. James Hospital.